Some of the Asian supermarkets around town have bakeries built in the corner and we sometimes pick up a few baked goods on our way out to snack on during the drive home. We especially like the cotton-soft cakes, such as the rolled sponges and light layered ones. So when we saw a viral post on a 3-ingredient Japanese cheesecake, we had to try it to see if we can replicate one of the fluffy Asian confections from the bakeries. This Japanese cheesecake is made with cream cheese and eggs, just like a New York-style cheesecake, but is airy like an angel food chiffon cake and not dense, creamy and heavy. We made ours mini size (6-inch round) and added a little vanilla for a hint of flavor. Japanese cheesecake is a sweet and simple snack or a light dessert after a big meal and is a good recipe to try on National Cheesecake Day. Prepare a 6-inch round spring form cake pan by lining the bottom and sides with buttered parchment paper (cut a 6-inch round circle and butter it and cut a strip at least 21 inches long and 4-5 inches high and butter it). Cover the bottom of the cake pan with a large foil piece to prevent water from leaking into it. Set aside. In a microwavable bowl, melt the white chocolate according to the package directions. Stir until smooth. Cool slightly. Mix in the softened cream cheese. 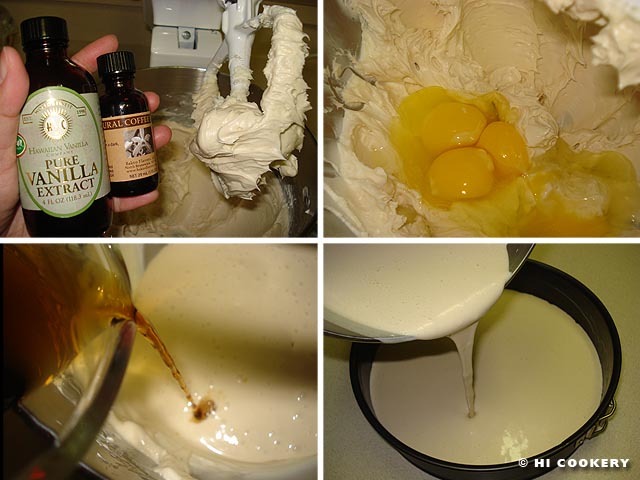 In a small cup, beat the egg yolks with the vanilla, if using. Add the egg yolk mixture to the chocolate-cream cheese. In another bowl, beat the egg whites until stiff peaks form. Gradually add small portions of egg whites to the above mixture and fold gently until incorporated each time. Pour the mixture carefully into the prepared spring form pan. Place this pan into a larger pan. Pour warm water until it reaches halfway up the sides of the spring form pan. Bake in a preheated oven at 350 degrees F for 40-45 minutes or until the cheesecake sets. Turn off the oven and leave the pans for another 15 minutes. Remove from the oven. Place the foil-lined spring form pan onto a wire rack to cool completely. Discard the water from the other pan. Remove the cheesecake from the pan, peeling away the parchment paper, and put on a platter. Chill for about 4 hours before serving. This Japanese cheesecake tends to deflate a little after it has been taken out of the oven but still tastes light and soft. Substitute the vanilla for other flavorings, such as strawberry, orange or raspberry extract and garnish the finished cheesecake with sliced strawberries, drained mandarin oranges or raspberries. Try coconut extract and sprinkle with coconut flakes. Try our other creamy cheesecake recipes on our blog for National Cheesecake Day. Sopaipillas are the official state pastry of Texas, where we currently live. Those puffy pieces of bread are sprinkled with cinnamon sugar and taste muy delicioso on their own. When made into a cheesecake, it becomes a doubly delightful dessert! 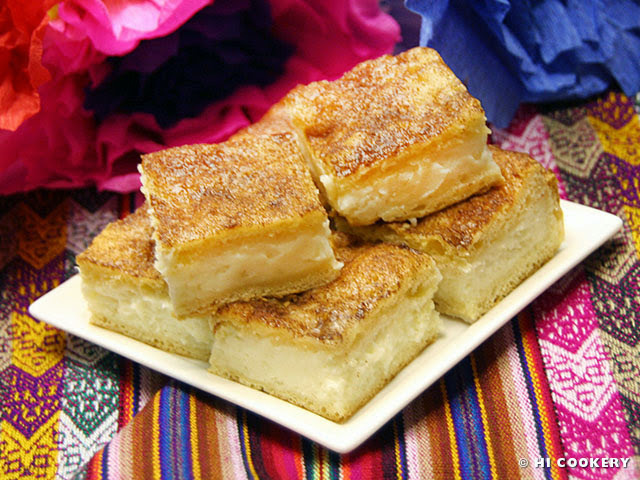 We got the recipe for sopaipilla cheesecake squares from una amiga at a fiesta and, in turn, we baked it for another gathering and got rave reviews! This crowd-pleasing confection is easy to make, especially when using ready-made refrigerated crescent dinner rolls, which puff up like sopaipillas. Try a Tex-Mex creation for National Cheesecake Day and make sopaipilla cheesecake. Line a 9×13-inch baking pan with foil and mist with cooking spray. 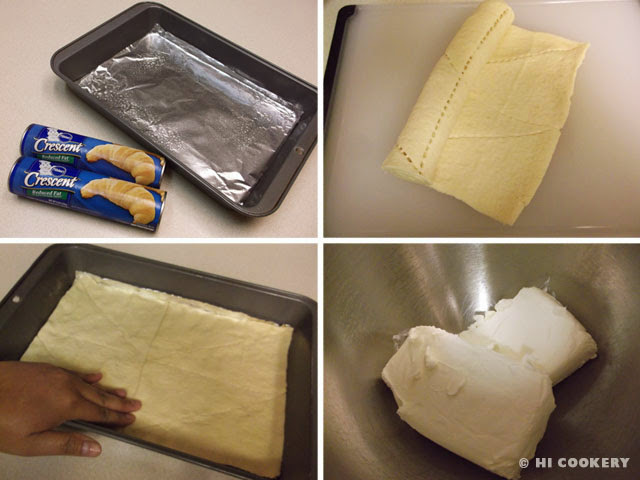 Unroll one package of the refrigerated crescent dinner rolls and flatten the seams together to make the dessert base in the prepared pan. Set aside. In a mixing bowl, stir the cream cheese with the sugar until smooth. Add the vanilla extract and continue to blend well. Spread over the dessert base. Unroll the other package of refrigerated crescent dinner rolls and pinch- flatten the seams together and place over the cream cheese mixture. Pour the melted butter or margarine over the top and sprinkle with the cinnamon sugar. Bake in a preheated oven at 350 degrees F for 30 minutes. Remove from the oven and cool completely to let the filling set (otherwise it will be runny). Refrigerate until ready to serve. Slice into squares and arrange on a platter or tray. Cinnamon sugar may be made by mixing 1 cup sugar to 2 tablespoons ground cinnamon. 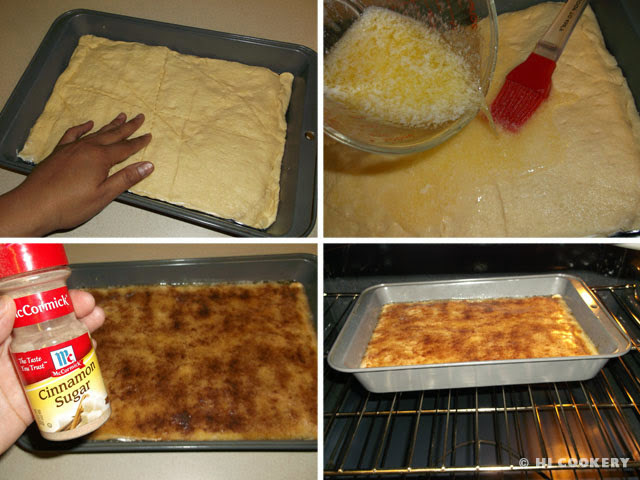 Muchas gracias to Brooke H. for sharing the recipe for sopaipilla cheesecake with us. On a family trip to the Big Island, we went on a tour of a Kona coffee estate and picked peaberries and nibbled on coffee cherries right from the trees. We had been to other coffee farms on Kauai and Molokai before, but coffee from the island of Hawaii is rated among the world’s best! 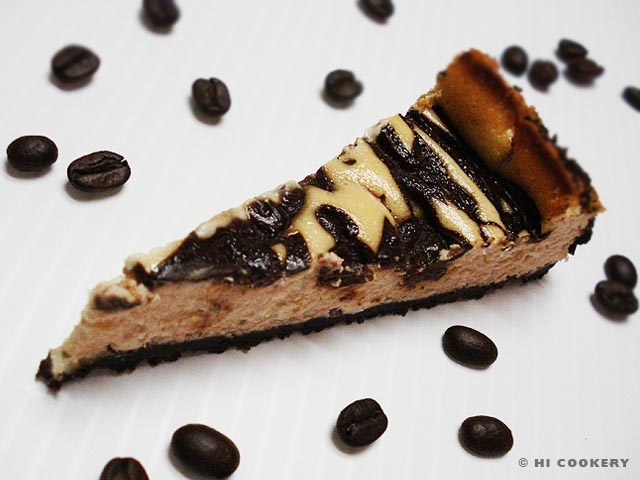 When we bake Kona coffee cheesecake with a mocha crust and swirl topping, we make it with the best ingredients from the islands—100% Kona coffee, Big Island vanilla and Kauai coffee cookies. It is pricey and tastes rich but it is definitely worth the splurge on National Cheesecake Day! 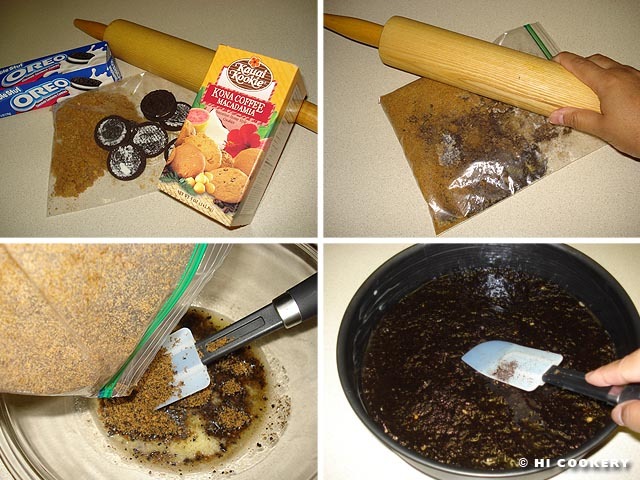 Place cookies in a zipper-top plastic bag. Crush carefully into crumbs using a rolling pin. Melt the butter in a medium bowl. Mix in the cookie crumbs, adding more if it is too buttery. Press mixture into a greased 9-inch springform pan. Set aside to cool while making the filling. Cream the cheese with the sugar. 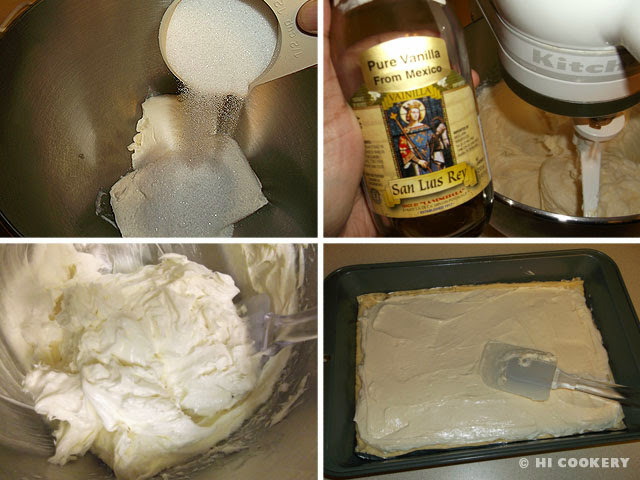 Add the vanilla and coffee extracts. Beat in the eggs. Stir in the Kona coffee. Mix until the batter is smooth. Pour over the cooled crust. Make the mocha swirl topping. Dissolve the instant Kona coffee crystals in water. Mix in the cornstarch until blended well. Melt the chocolate. 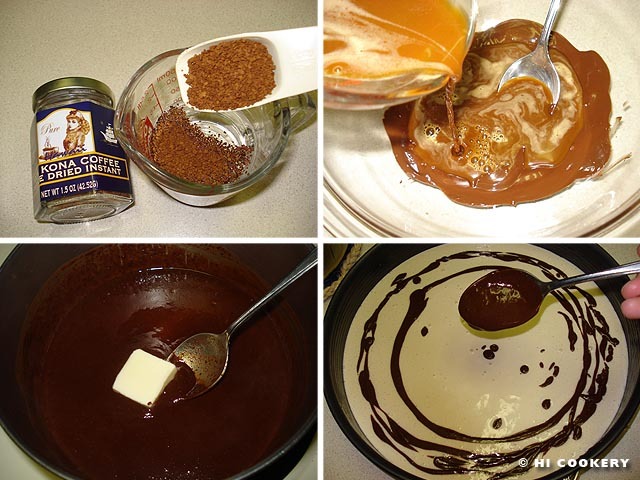 In a saucepan, stir the coffee mixture with the melted chocolate over low heat until thickened. Add the butter and stir until melted. Drizzle decoratively over the top of the cheesecake batter. Bake in a preheated oven at 400 degrees F for 30 minutes. Remove from the oven and let cool to room temperature. Cover the pan and refrigerate at least six hours or overnight until the cheesecake is set. Run a butter knife or spatula around the edges to loosen, remove from the pan, brush off the crumbs and transfer the cheesecake to a round board or platter. Slice and serve chilled. Beware of the blends! Only coffee grown on Kona can be legally labeled as such. Coffee grown on the other Hawaiian islands must be labeled otherwise. Also, check the package for whether it is 100% or a blend (which might only contain 10% Kona coffee). Prices are set high for premium products! Some similar recipes recommend baking the crust in a preheated oven at 350 degrees F for 5-10 minutes. 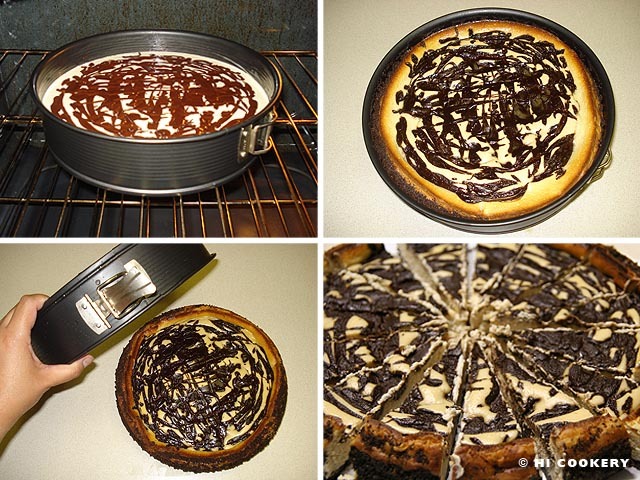 But we skipped this step and the cheesecake still turned out fine. If necessary, cover the outside bottom and sides of the springform pan with foil to prevent leaks. Then bake the cheesecake as usual. Thanks to our friend Lisa L. for the expensive bottle of Big Island vanilla from Hawaii and for the springform pan from Germany. e komo mai. Greetings and welcome to HI Cookery! Highlander and Islander (HI) are gradually building this blog by attempting to "cook the calendar" with ethnic and eclectic recipes. Thou shalt not steal! All text and images in HI Cookery are the property of Highlander and Islander.